STUDIO EFFECTS by ARDELL. Strip eyelashes. They perfectly fill gaps, and add volume and length to natural hair, making them perfect for both daily and evening make-up. 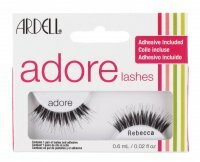 The product was enriched with tufts on the outer edges, giving the effect of fuller lashes. In addition, it is extremely soft, so their length can be adjusted with scissors. Reusable. Extra tufts on the outer edges. 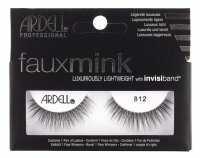 They provide the effect of dense eyelashes. They will give everyone a glimpse of the sensual dimension. Length can be adjusted using scissors. 1. Put artificial eyelashes on your eyelids. If they are too long, cut them from the outside. 2. Apply glue to the lashes. 3. Wait for a moment for the glue to get a little cooler. 4. Stick the eyelashes starting from the outer eye corner, leading them just above the line of your eyelashes inward. 5. Gently press the eyelashes to your eyelids. 6. 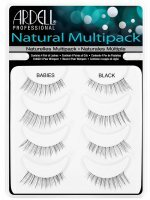 Combine the artificial lashes with the natural ones, catching them between the toes and pressing one against the other. *Adhesive is not included in the set.